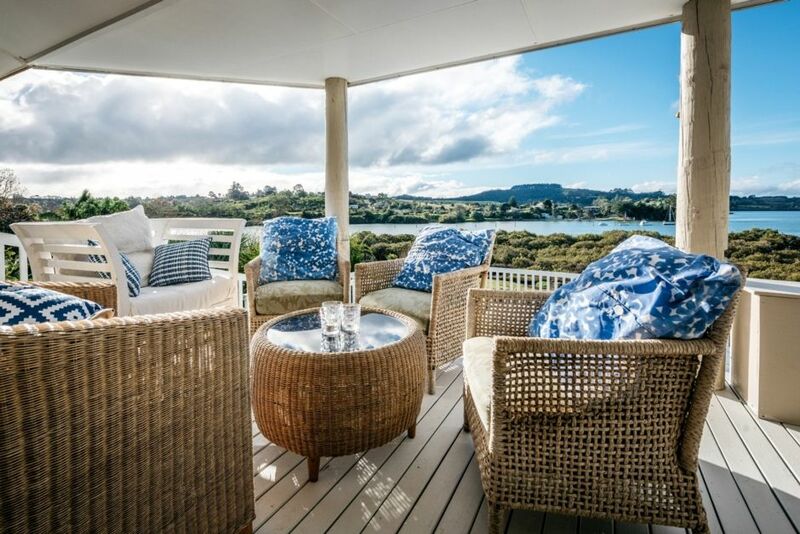 The Lookout offers an amazing lifestyle for families or groups of friends looking for an affordable holiday with all the things that make living or holidaying in Kerikeri so fabulous. The house is spread over two levels so you have breathtaking views from the upper levels and lots of flat land below for ballgames or tents. The kitchen is well equipped and the dining tables both inside and out easily sit ten. Our bathrooms are not your "dripping taps bach style" but clean and fresh! We have furnished The Lookout in an easy coastal style so it is a relaxing and inviting place to stay if the weather turns, and in the Summer you'll live outdoors on the expansive decks and enjoy our huge pool. It is perfect with everything needed on for your holiday and in style. Kerikeri and its bustling cafe scene is 4k's away and an easy flat run or walk, your nearest sandy beach is a locals' secret at the end of Wharau Rd and only few minutes drive away. We are hoping to share the essence of Kerikeri living with larger groups who will appreciate all we have to offer at a fabulous price. We have a minimum 4 night booking over the Christmas/New Year period. We are delighted to be able to offer guests the opportunity to enjoy 10% discounts on Salt Air's helocopter or fixed winged tour flights to get a wonderful high level perspective of the Far North. Please check out Salt Air's website. The cleaning fee is a contribution, which means the house has to be left neat and tidy! Quiet period after 10:30pm but please resoect the tranquility of the neighbourhood at all times. Familes welcome- please supervise children outside at all times. The Lookout may not be suited for Infants under 2. No cooking pungent cooking (curries, fish etc) inside - only on BBQ side burner to keep kitchen sweet for future guests. For bookings and enquiries beyond December 2020 please contact the owners to confirm the pricing. Great outdoor areas and lots of flat land for the kids plus a trampoline and playhouse. Please make sure all pockets are empty before use! 2 bodums/plungers 1 small espresso machine 1 electric espresso maker Please ensure all are c;eaned well after use. There is a very complete range of plates, dishes, cutlery and utesils. Large! Some pool toys available. This place is amazing. Comfy, loads of space to spread out and relax. Pool was fab and you likely won't want to leave (we didn't). Property and location is amazing. House is fitted out with everything you need. We lived in the pool. Thanks so much sally, we will be back again.